The Lodges have been newly built with fishermen in mind. 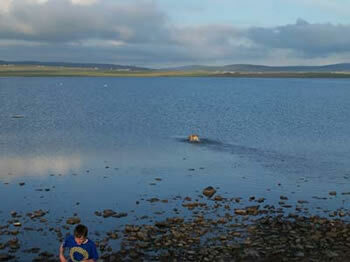 The farm is on the edge of the Harray Loch and has approx 2 miles of loch shore. All fishing in Orkney is Free so you have ample access on your doorstep to the 1500 acres of prime fishing, with islands, skerries and bays producing fish all season through. 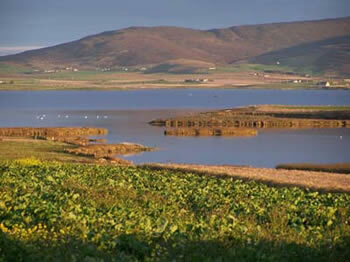 There are also various other lochs in the west mainland all with excellent trout fishing opportunities. The Lodges are equipped with a rod/drying room and a utility room to clean and gut your fish as well as ample fridge and freezer space to store your catch. Breakfast and an evening meal can be provided using local produce, even your freshly caught trout, if you prefer to eat in and don’t want to cook yourselves. This needs to specified at the time of booking and will cost £25 per person per day. There are local fishing tackle shops in Kirkwall and Stromness should you require any supplies during your stay in Orkney. There are various other activities should everyone in your party not want to go fishing every day. Both Stromness and Kirkwall have lots of small boutique shops, selling locally made high quality Jewellery, Clothes, Paintings etc. There are coffee shops nearby and a couple of local therapists who will provide treatments of Reiki, Reflexology and Massage in the Lodges.